Light emitting diode (LED) is component its convert the electrical signal into a corresponding light that is injected into the fiber. Basically, the light emitter is a key element in any fiber optic system. Essentially LED is a PN junction diode. A basically conventional p-n junction is called as homojunction as the same semiconductor material. The electron-hole recombination occurs in relatively wide layer = 10 micrometers. As the carriers are not confined the immediate vicinity of a junction, hence high current densities cannot be realized. 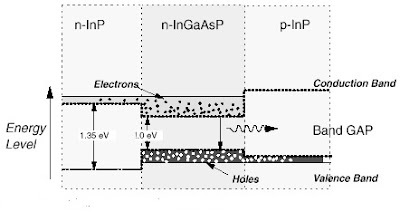 The carrier confinement problem can be resolved by sandwiching a thin layer of 0.1 micrometers between the p-type and n-type layers. When the carrier confinement occurs due to bandgap discontinuity of the junction. Such a junction is called heterojunction and its device is called a double heterostructure. 1) In LED bit rate of 100-200 Mb/sec. 2) In LED optical power in tens of microwatts. A (heterojunction) is an interface between two adjoining single crystal semiconductors device with different band gap. In order to achieve efficient confinement of emitted radiation double hetero-junctions are used in LED structures. In double hetero-junction, the crosshatched regions represent the energy levels of free charge recombination occurs only inactive InGaAsP layer. A hetero-junction is a junction formed by dissimilar semiconductors. Double heterojunction ( DH) is formed by two different semiconductors on each side of the active region. The figure shows double heterojunction (DH) light emitter. The two materials have different refractive indices and different band gap energies. The changes in band gap energies create the potential barrier for both holes and electrons. The free charges can recombine only in narrow, well defined active layer side. A double hetero-junction (DH) structure will confine both electrons and holes a narrow active layer. Under forward bias, it will be a large number of carriers injected into the active region where they are efficiently confined.